Each year I receive hundreds of emails from frustrated consumers. They’re all looking for the deck sealer / stain that offers the best performance - they’re looking for the Holy Grail of deck sealers. 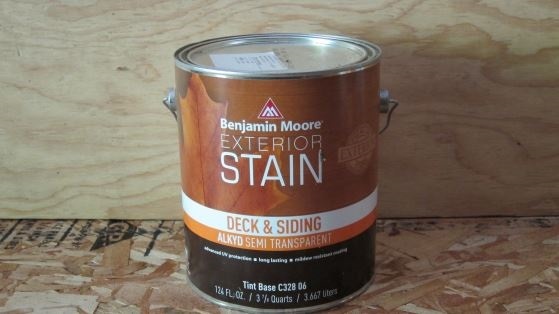 I decided I’d do a side-by-side test of as many deck stains /sealers that I could get my hands on. 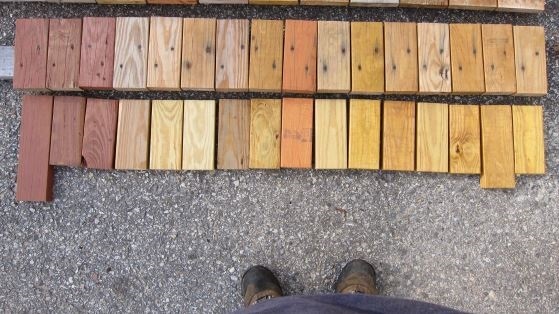 On May 12, 2012, thirty-two pieces of cedar decking and thirty-two pieces of regular treated lumber were stained with off-the-shelf deck stains / sealers. 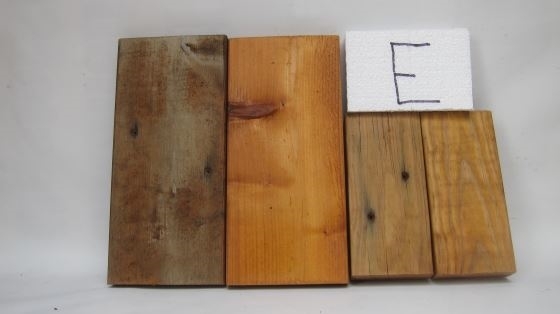 Sixteen different wood sealers / stains were used to coat the lumber creating two identical sample sets. One set was immediately exposed to the weather and the other set was boxed up and stored indoors away from sunlight and all weather. The control pieces placed in the box were to be used in a series of photographs to show how the deck stains performed after the other pieces weathered for nearly a year. 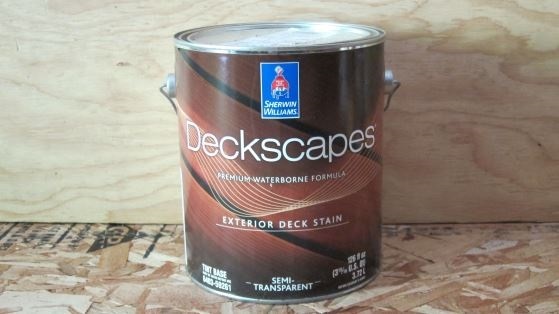 Every brand name deck sealer company was contacted to participate in this real-life test. Many companies refused to participate in the test. 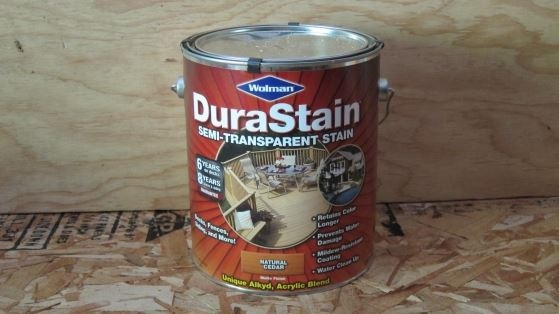 TWP, Armstrong’s, Defy, Behr, Benjamin Moore, Wolman’s, Sherwin Williams, Olympic, and Thompson’s. Some manufacturers submitted different blends and colors for the test. As you look at each photo, you’ll see the wider cedar decking on the left and the shorter and narrower pieces of treated pine lumber on the right. The pieces of wood that were exposed to the weather have two screw holes in each one as they were screwed to a ﬂat 2x4 to simulate resting on a ﬂoor joist. 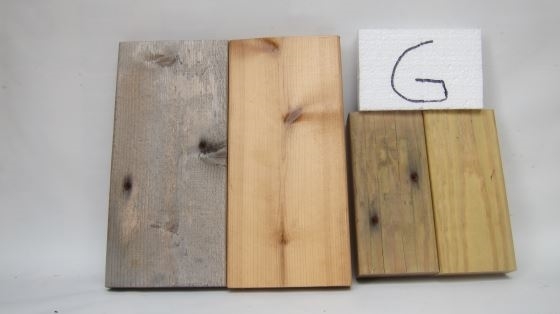 They’re the left-side samples of each pair (except in sample B where the treated lumber left outdoors is on the far right). The pieces of wood exposed to the weather were set out on my dock on Lake Winnisquam in central New Hampshire. The shore line faces east, so the boards experienced brutal sunlight from dawn until mid-late afternoon. The pieces of wood were set side-by-side on the dock separated by maybe 3 inches. In other words, the cedar and treated lumber each received identical amounts of sun, rain and shade. 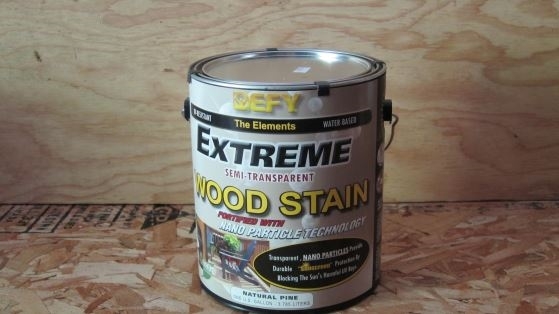 The Winner, in my opinion, was the Behr Premium Semi Transparent Stain - Sample H.
The Loser was Wolman's Oil-Based Clear Sample L.
Sample P (Benjamin Moore Semi-Transparent) came in a close second to the Winner Sample H.
Treated lumber contains copper which leaches out and kills mildew and mold if it gets enough sunlight.